In this article, you will come to know the revolutionary changes in the connected vehicle.Let's welcome the new developments in the automotive industry and getting the networking opportunity on Connected Vehicle 2018. The Automotive sector is undergoing a transition. The modern car has changed a lot from what it used to be a decade back or so but this change is far from over. In fact, the industry has reached a turning point from where the pace of change will be more brisk and transformative. The automotive industry is being shaped by the trends like autonomy, connectivity, electrification and shared mobility. It is expected that in next few years the way we look at cars will be completely changed. The autonomous car has emerged as the priority for almost all auto manufacturers. The automakers are working to develop these technologies and are optimistic to launch autonomous cars in coming years. Features like lane departure warning systems, brake assist (BAS), smart navigation systems, parking and traffic assist, collision assist, etc. are now being made available as the standard offering by the automakers. Digital cockpits laden with advanced infotainment features and with In-car shopping and in-car payment are also gaining ground and a number of companies are adding these feature in their cars. Connectivity features like OTA(over the air update) updates is evolving as the standard feature, which companies are using it to keep their cars updated. This has also increased the vulnerability of the car to cyber attacks which are also evolving as a separate domain. The software content in the cars has increased remarkably and the automakers are forming partnerships with the IT industry and are acquiring smaller companies and startups working to gain competencies in this field. In India, the automotive industry is not untouched by these changes and the automakers here are also introducing connected car features in their products. The companies for the purpose are collaborating across different domains. Tata Motors is working with Microsoft; Nissan India is collaborating with Pointer; Honda Cars India is collaborating with IBM Watson; Minda iConnect with Microsoft India; and Reliance Jio Infocomm with AirWire etc. Many new players are also entering the automotive ecosystem bringing in their innovative ideas and fresh perspective. Connected vehicles, based on V2X (vehicle to everything) and V2V (vehicle to vehicle) communications, provides benefits like reduced fatalities and serious injuries. It enables the infrastructure to communicate with oncoming vehicles, so it can warn of road repair work or a reduced speed area. It also enables real-time data exchange among the vehicles(DSRC) in the proximity which can assist in overtaking large vehicle amongst many other benefits. Furthermore, the driving data generated from the sensors can be used to analyze "quasi-accident" situations, where safety systems take over in an emergency situation to prevent an accident. Real-time traffic information can also be used to reduce congestion which has the significant impact on the economy through losses in form of fuel costs as well lowering of productivity. Reductions in congestion and smoother traffic flows have the positive effect on the environment as well as they also cause a significant reduction of pollutant emissions. Apart from these advantages connected vehicles technologies also enables mapping services, in-vehicle infotainment, shopping on the go, connected office, remote diagnostics, updating of car software in real time and thus make the lives of the passengers better, productive and more efficient. In coming years connected vehicle technology will engender a whole new type of products and services operating on business models that have been nonexistent till now. Considering the situation it is important for members of the ecosystem to be updated and connected with the specific interest group professionals; be it technological or business-centric. For the purpose, Telematics Wire has been coming up with daily updates of the industry through its portal and with perspective from within the industry through its bi-monthly magazine Smart Automotive. 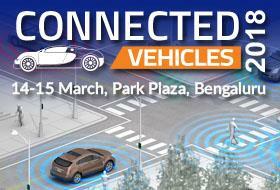 To further the cause of connected vehicles, Telematics Wire in association with CoE-IoT| Nasscom is organizing a national conference- Connected Vehicle 2018 on 14-15th of March at Park Plaza, Bangalore. It will be attended by the luminaries across the automotive domain along with members from the senior bureaucracy, bringing in insights from their respective fields. There will be 600+ attendees and over 50 speakers. In addition, more than 40 companies will be exhibiting their products and technologies related to the connected vehicles during the conference. 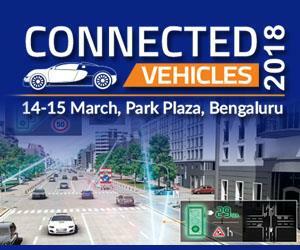 Connected Vehicle 2018 will be a blend of new developments in automotive industry and networking opportunity while getting to interact and discuss with the notables of the domain. Auto enthusiasts should not let go of this opportunity!